The jewelry designer Kimberly McDonald is most known for her pieces featuring geodes, agates and quartz accentuated with gold, diamonds and semi precious stones and she has an avid celebrity following that includes Sarah Jessica Parker, Kate Hudson and Brooke Shields. 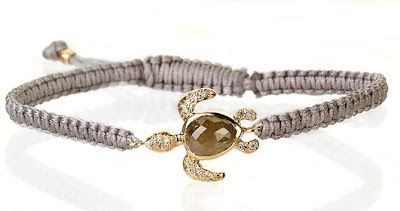 McDonald has recently created a new limited edition "Sea Turtle Macramé" bracelet collection in support of the National Wildlife Federation's efforts following the Gulf oil spill. McDonald has created 50 limited edition, hand crafted Sea Turtle macramé bracelets with 100 percent of all proceeds going towards NWF's efforts to respond to the wildlife crisis unfolding in the Gulf. "When I learned about the amazing work that the National Wildlife Federation is doing to support wildlife rescue and rehabilitation efforts in the Gulf, I immediately knew that I needed to do everything in my power to support their efforts in easing the devastation occurring to our wildlife" McDonald said. "It is my hope that the collection will inspire people to get involved and take the state of our environment seriously. At the end we hope to protect vulnerable species such as the sea turtle by raising $100,000 for NWF." Each bracelet is made from 18K recycled gold, reclaimed diamonds, a diamond briolette, and hand-woven silk macramé. The bracelets will retail for price at $2,000 - $2,500, and they are available at Mitchells in Westport, Connecticut, Richards in Greenwich, Connecticut, Marshs in Huntington, New York and Wilkes Bashford in San Francisco and Palo Alto, California. Browse bracelet design online at Rockrush.com.